Event Steward’s Log: It’s been a busy week! I wrote up a letter to chatelaines to encourage them to promote the event, and sent that to the kingdom chatelaine for distribution. That letter included a letter that chatelaines could, in turn, send to individual newcomers about the event. I wrote up and sent an e-mail for advertising the Laurels and artisans that would be on site (BTW, it would be nice if people let me know if they forwarded it that, thanks!) Tymme cleverly noticed that the Laurel list was longer than the one that he put on the website and asked for a clean list so he could update the website. Since the initial publication of that list on Facebook, several Laurels and artisans have added that they are attending. So I sent him the update and we e-mail chatted about related things. Also, I made a new biffy posting for July Coronation, one aimed more at the general populace rather than those who are already experienced artisans. I don’t want people to think that this is just an event for Laurels to hobnob with each other. I ran off 3 copies and they are in a folder ready to take to coronation. Event Steward’s Log, Supplemental: I make it a general policy to double-check everything; this especially means confirming things with people, even if I have exchanged messages or had conversations with them. Coming back to make sure that you have the right information or that the other person understands what you need from them can save a lot of trouble and emotional turmoil. For example, the person at the site said I didn’t need a certain piece of paperwork that had been required by the school district last year. To be sure, I checked with the district officer person in charge of facility rental. Lo and behold, I did in fact need that piece of paperwork. Turning it in promptly saved panic later, and even cost, since this was the paperwork that allowed us to waive a janitor. Basically, I think being an event steward requires a certain amount of paranoia. I assume that somebody – not everybody, but somebody – is going to forget something. So I spend some time checking in with everybody, because I do not have the psychic powers to know who that person is going to be this time. Even Steward’s Log: This week has kind of been low key. I exchanged messages with some people about the event, so I’ll be able to add a couple more Laurels to the list coming. I talked with the kingdom chatelaine about promoting the event with newcomers. Baronal polling has been extended. Please, send in your form! Please tell everyone you know who live in the borders of wyewood to send in their polling form. The crown is really looking for feedback on our selected candidates. So much so, they have extended the polling deadline for them. Also, if your minor children are SCA members, they probably got a polling form too. While you may feel that your child is too young to have a say, their voice still counts towards our total population. That includes people who live outside of Wyewood but play with us. Send their Magisties a missive explaining this along with your opinion of our current candidates. Any reply….. positive, negative or neutral is much, much, *much* better than no reply at all. IMPORTANT: While this response rate “problem” has been an major issue for us in the past, I have just (now) been assured by people in the know that a low response won’t affect our baronial status. But, it could affect the selection of who will be replacing Gabri and myself. Since I also figure that the people who play with someone else won’t be reading this on the Wyewood lists. So I will be trying to forward this to the surrounding baronies. In service to the Kingdom, Crown and the Barony. Event Steward’s Log: This last week I have been focusing on getting the word out about what Laurels and artisans will be at Arts Unframed. Since one significant draw of the event is who is there to hobnob with, I want to get that info out well in advance of the event. Part of this meant checking with several of those Laurels to see what their preferred title is (Dame, Mistress, etc.). Once I had that all together, I posted the list on the An Tir Calendar page and on the Facebook page, and sent the info to Tymme to add to the event’s website. I want to send out an e-mail as well, but I’d like to compose a good intro for it so maybe that will happen in a day or two. Additionally, I chatted with a person with some marketing education about how I can aim some of the marketing at newcomers/ people who are new to the arts. They had some great ideas like words to use in ads and working with chatelaines. I hope to implement some of those withing a couple of weeks! HERALD: Mir not present. Needs/want to train more voice/court Heralds. BARONIAL MARSHAL/ARCHERY: We got a special mention in a video by Glymm Mere. When asked if they feared Wye archers the response was YES! We are defending Glymm Mere against BAO in Honey War. Wye’s Geoffrey won the novelty shoot at Junefaire. Wyewoodians brought home lots of prizes, YAY! 4 July shoot, 10-1pm. Rignach bring a grill. Music practice – various Mondays throughout the month, Lady Matillis, avg 2ppl. Fiber Night – meetings held first Thursday of the month, Dame Esclarmonde, avg 4ppl. Culinary –meetings held fourth Wednesday of the month, Constantia in der Lachun, avg 4ppl. Scribal – various days throughout the month, Lady Alamanda, 2ppl. 3rd Heraldry class had 9 people. Future class: How to write a A&S paper. EXCHEQUER: No outstanding checks. Church and Storage need to be paid for next 6 months. CHRONICLER: Caught up on backlog of minutes. CHAMBERLAIN: Storage is fine. Avine wonders if we have renter’s insurance? SCA insurance covers our storage. WEBSTER: Isadora sent in her report. BARONESS: Honey War: Wye archers offered to Glymm Mere. Offer accepted. Sergeantry Badge passed conflict check. Received mote Gold Key. Baroness is very pleased with the B&B candidates. BARON: Replacement process continuing. He has some glass tokens for the game box. Last court should be at Champions. He will day-trip Coronation. Sophia asks B&B about Sergeantry Trials, who and where and when? Answer seems to be: No one, nowhere, and will not be happening this year since our last candidate has dropped out! Baroness calls for populace to consider being Sergeants! -Wyewood Champions: No update. Reaching out to Alamanda for help with invitations for local B&Bs. Archery has the format for Archery Champion Tourney and will post to email and social media. -Arts Unframed: May need new person for gate if Constantine can’t be there. Liadainn volunteers to cover gate if necessary. Has paperwork from the school district. Lots of Laurels signed up to participate in the scavenger hunt and consult tables. Website is up and Crier copy is in. -12th Night: One merchant signed up. Alamanda is making/getting tokens. Kate is doing decorations. -Feast of St Bubba: Pre-planning meeting soon. Rignach is the head cook. -POLLING: Send your forms in by June 30!!!! -Project day at Greywolf July 10. -Scribal days at Alamanda’s: this Sunday at 1pm and Sunday July3 at 1pm. Event Steward’s Log: This week I received the estimate for billing from the school district. Thanks to the on-site person liking us last year, we again won’t have to pay for a custodian at all. I did forget that charge us for heat/air conditioning, but that’s about the same cost as I had built into the budget for a custodian “just in case” so that’s OK, budget-wise. I also submitted copy for the event to the Crier, and continued to do some clean-up of my laurel volunteer list (just formatting, but it makes it easier to find what I want later). Event Steward’s Log: Looking at last year’s paperwork, I noticed that last year I had filled out a “Principal’s Designee” form, which is what allowed us to get away with not paying a custodian since I was the designated employee on site. I asked the on-site person at my school if I needed one filled out this year and he said no. I checked with the person who handles rental billing at the district office and they said yes, and sent me a blank form. I filled it out, scanned it, and e-mailed it back. The district person kindly confirmed receipt. I think that means she has everything now. I posted to the Facebook pages of An Tir Laurels and Western Region Laurels asking for people who were willing to be on the Laurel Scavenger Hunt or A&S Consult table. Those who responded I added to my continuing list, again including what activity they wanted to do. We had a Western Region Laurel meeting on Sunday, at which I got a few more volunteers. After the meeting I added them to the list as well. At the end of last week I sent a message to the district office to see if they got all the paperwork, including the insurance certificate. It turned out that the insurance certificate had arrived, but not the application. I checked with the on-site person to whom I’d given the application, and it turned out he was holding several for the next school year and planned to turn them in all at once to the district. Well, at least I know it didn’t get lost. I went to Junefaire to promote the event. I put up biffy postings, and handed out fliers to all the people I could in the A&S demo area. I talked to Laurels on site to ask if they could make it to the event and participate in the Laurel Scavenger Hunt or A&S Consult table. Over the days after Junefaire, I put the names of Laurels who could help in an electronic Word document. I noted what activities they were able to help with, and whether I needed to contact them later because they weren’t able to commit at this time. I sent out an e-mail advertising the event to the Wyewood List and Laurel’s list. This Friday at the FCS we will have an opportunity for you to chat with and ask any questions you may have of the baronial candidates. Although we had a number of candidates nominated only one couple was able to accept their nomination; Lady Alessandra and Lord Evrard. Below is the letter of intent that was submitted as well as both of their SCA resumes. Unto Their Royal Majesties Eirik and Driffina, Their Royal Highnesses Kjartan and Sha’ya, Their Excellencies Robert and Gabrielle, and the wonderful populace of the Barony of Wyewood, do we, Lord Evrard de Valogne and Lady Alessandra da Montefeltro send our warmest and most humble greetings. This letter shall serve as our honest intention to put ourselves forward for consideration as candidates to serve as Baron and Baroness of Wyewood. To that end, we acknowledge and can accept the commitment of three years of service to the Barony of Wyewood, of which we have seen the responsibilities as laid out in Corpora and in the baronial customary. If chosen, we intend to make ourselves available to the populace through all means be that in person, phone, email or social media. Our vision for the future of the barony is to foster growth. Growth not only through creating a welcoming environment for any newcomers but also by encouraging all of our populace to explore the many opportunities available within our barony, the kingdom, and Society. To improve quality and increase enjoyment of everyone’s’ participation. Service and expanding knowledge is very dear to both of us. We are both currently officers of this barony and marshals. We attend practices and project days. In addition, teaching and taking courses in new skills has deepened our appreciation for The Dream and has kept us both participating for over 20 years. It would be our goal to inspire others to find their path, wherever it may lead. We wish to serve as Baron and Baroness out of our love for the Barony – our family. The populace has gained notice for its dedicated service; hospitality; open welcome of visitors, old friends, and new members; and their support of each other and the barony. Guiding gently, maintaining the Baronial tradition of fun and welcome, we will continue to foster the feeling of community by building upon the efforts of our founding coronets. Wyewood is full of amazing individuals and the Baron and Baroness are nothing without them. As such, we intend to support our officers and populace to the utmost of our abilities. We will also rely on them to help make our vision a reality. As representatives of the Crown, we will be open to our populace; listening to them, their thoughts, their feelings, and relaying those opinions to the Crown as well as communicating the wishes of the Crown to our Populace. Began SCA in 1991 at Junefaire. Started shooting archery in the same year. Started fletchng my own arrows in 1992. Have crafted over 1500 arrows in my career for myself and fellow archers. I greatly enjoy the creative process of crafting beautiful precision equipment and the constant learning of new and old techniques. Started with Wyewood in 2003, quickly became deputy to branch herald. Restarted archery in Wyewood in 2004, became Chief Archer. Since then archery has been a major force for the branch in numbers, activity, a ccomplishments and service to the kingdom. 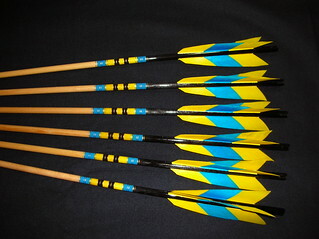 In addition to fletching arrows I also am a resource of finding suitable bows for new archers. I will find used bows on ebay/craigslist for reasonable prices, clean the bows up from just removing old tape and leather to completely refinishing the bow. Participated in a weekly armor workshop for 3 years in Wyewood at Tristan de Ver’s home. Developed a Cherbourg style plastic plate body armor covered in leather and assisted in making 24 sets for prospective and current fighters. We made gorgets, gauntlets, greaves and vambraces of mostly leather and plastic. Also gave basic instruction in fighting techniques. Warranted TAM in 2004, Senior in 2006. Thrown Weapons Marshal in 2006, Senior later that year. One of the original Fyrdmen of Wyewood, fought sword and shield for seven years. Chief Archer of Wyewood 2004-05 Re launched archery in the branch in 2004 and fostered it to its current strength of over 70 archers registered in our groups listing. Contingency Deputy to the Kingdom Royal Archer 2007-2011 Assisted with re-write to the Book of Target in 2010. I also was the MIC of the Kingdom Protector Tournament for two years. Chief Archer of Madrone 2007-2011 MIC for September Crown as the hosting branch and three time MIC for Emprise of the Black Lion and Lionhearts archery championship. Basic Archery, Intermediate Techniques on a weekly basis at the Wyewood archery range.